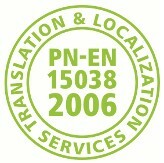 EN 15038 is the European Standard for Translation Services which was adopted by the European Committee for Standardization on 13 April 2006. It sets and harmonizes standards and procedures for the performance and revision of translations, recruitment and competencies of translators, relations with clients and additional services performed by language service providers. Keeping the standard demonstrates the efforts we make to ensure our translations services are consistently high quality, always meet our clients' requirements and needs and are carried out in accordance with the generally accepted standards of the translation market.